I have not posted in a while, sorry about that. I have lots to share about Cocoa! About two weeks ago I moved his cage from the living room to my bedroom. I have a pretty small bedroom as it is, so it seems even smaller now. At first I was always waking up at night to hear Cocoa playing or shredding newspaper. Now I usually just sleep through all that noise! 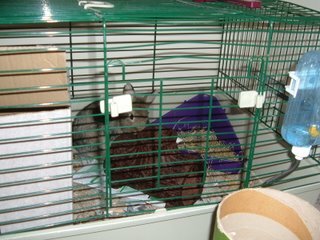 It is a lot easier to keep his cage in my room for many reasons. First, it is quieter in there. Second, when I want to let him out, I don't have to try to pick him up. (he doesn't like that) I can just open his cage door and let him come out when he wants. And the third reason it's better for him to be in my room is because Phoebe - my roommate's cat, doesn't come in there and bother him much. Also, last weekend Jeff bought 2 new things for Cocoa. A hay rack and an activity log. 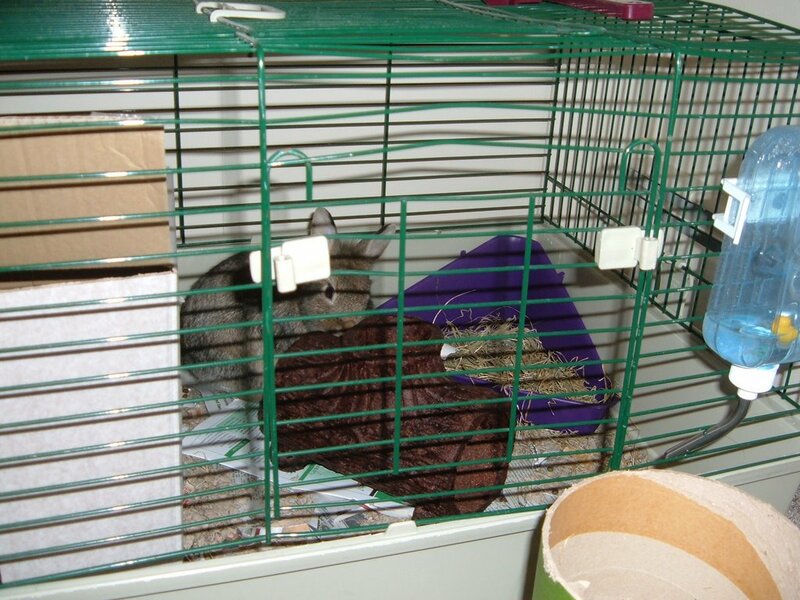 The hay rack attaches to the outside of the cage and keeps the hay neat so it doesn't get scattered everywhere. And the activity log is from Ecotrition. It is 100% edible made from alfalfa and honey. Cocoa loves it! Yeah, I like him better in your room. It's fun having him in there. i have 3 lionhead bunnys and they have the healthy log too!